A 1980 APA/SCS committee report (Research Tools for the Classics) was correct on both counts to declare cartography at that date “an area of extremely great importance, where the state of our tools is utterly disastrous.” The panel briefly discusses the disappointing lack of progress made during the previous past century, and advances reasons for its limitations (Papers #1, 2). The main focus of the five papers, however, is on the transformation successfully achieved since around 1980, and still ongoing. Three shifts may be identified as the keys to this transformation. First, as Paper #1 explains, the more open, culturally sensitive approach to pre-modern cartography generated by the geographers Brian Harley and David Woodward has unlocked a fruitful, far-reaching re-appraisal of the purpose and value of ancient maps which is by no means yet exhausted. Second, Paper #2 recalls the decisive insistence by the 1980 APA committee that, in view of the inadequacy of existing efforts worldwide to produce a major classical atlas or equivalent, the APA itself should take the lead in sponsoring one. After initial failure, a decade-long international collaborative project to create such a reference work was successfully launched and funded, resulting in the publication of the Barrington Atlas of the Greek and Roman World by Princeton University Press in 2000. Third, the fortuitous transition from film-based mapmaking to digital during the 1990s made it practical to convert the Atlas and its data – with the use of digital technology – into a far more flexible and versatile resource than previously envisaged. This technology, which has itself continued to develop, has given cartography a scope, complexity and richness unimagined in 1980. Paper #3 in broad terms appreciates and illustrates this capacity for the advancement of the ancient field. Paper #4 does likewise, but with specific reference to the expanding range of the Ancient World Mapping Center, the first institution of its type to be established (in 2000) for promoting cartography, geographic information science and historical cartography in the ancient field. The Center was an unforeseen, visionary outgrowth of the project to create the Barrington Atlas, one which has amply fulfilled its promise. Paper #5 offers an outstanding instance of how state-of-the-art digital technology can now bring to the study of a Roman monument a depth of insight unattainable until recently. Moreover, this exciting new work on the Forma Urbis Romae fragments and the surviving wall to which they were once attached is a model of collaboration between Rome’s Musei Capitolini and the Ancient World Mapping Center. The coherent, logical sequence of the panel’s five papers demonstrates to SCS not only that cartography today remains more than ever of extremely great importance to the ancient field, but also that the state of tools for it has now changed from disastrous to extraordinary, with further creative developments to be confidently anticipated. N.B. Because of more or less certain difficulties in obtaining permissions, the images shown at the panel to accompany each paper are not included here. The seven large Wall Maps produced by the Center and published by Routledge in 2011 have gone out of print, and the rights have reverted to the Center. We are pleased to make all seven available digitally (Map 6 now incorporating small corrections). Please email awmc@unc.edu for a link to download one or more files. It is possible to print from these files. The series is openly licensed under Creative Commons by 4.0. • View all seven maps both from a distance and up close. • Designed for use, not by specialists, but by students new to antiquity and by their instructors in introductory courses. • Clear, uncluttered presentation of places and features most likely to be encountered at this entry level. • Familiar English forms for names are normally marked (except on Map 7). No accompanying text or gazetteer. • Locator outline shows the scope of each map in relation to others in the set, incorporating the boundaries and names (abbreviated) of the modern countries covered. Dimensions (in inches) are for the entire map, width x height. All maps are plotted on 300dpi satellite images in the public domain; landscape is returned to its ancient aspect. Inks/color palette: red, green, blue. 1. (70 x 50) Egypt and the Near East, 3000 to 1200 BCE. Scale: 1:1,750,000. 2. (70 x 50) Egypt and the Near East, 1200 to 500 BCE. Scale: 1:1,750,000. 3. (66 x 48) Greece and the Aegean in the Fifth Century BCE. Scale: 1:750,000. 4. (65 x 35) Greece and Persia in the Time of Alexander the Great. Scale: 1:4,000,000. 5. (70 x 58) Italy in the Mid-First Century CE. Scale: 1:775,000. 6. (65 x 50) The World of the New Testament and the Journeys of Paul. Scale: 1:1,750,000. Inset “New Testament Palestine” (Scale 1:350,000). 7. (75 x 56) The Roman Empire around 200 CE. Scale: 1:3,000,000. The Center is happy to announce our latest entry: The Black Sea Region Described by Arrian around 130 C.E., in the Maps for Texts series is now available online. The single static map matches the scale (1:750,000) and presentation of the Center’s Asia Minor in the Second Century C.E. (2017). The map is accompanied by a listing of the names in Arrian’s Periplus, with references to the Barrington Atlas and its Directory, and to the editions by Alain Silberman (1995) and Aidan Liddle (2003). This listing of names is available via dropbox. For a link to download the map, which prints at 86 in by 45 in (at 300 dpi), please email awmc@unc.edu. 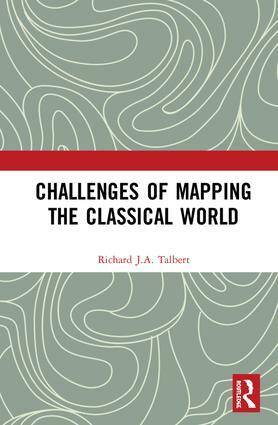 About the book: Challenges of Mapping the Classical World collects together in one volume fourteen varied items written by Richard Talbert over the past thirty years. They cohere around the theme of mapping the classical world since the nineteenth century. All were originally prompted by Talbert’s commission in the late 1980s to produce a definitive classical atlas after more than a century of failed attempts by the Kieperts and others. These he evaluates, as well as probing the Smith/Grove atlas, a successful twenty-year initiative launched in the mid-1850s, with a cartographic approach that departs radically from established practice. Talbert’s initial vision for the international collaborative project that resulted in the Barrington Atlas of the Greek and Roman World (2000) is presented, and the successive twice-yearly reports on its progress from 1991 through to completion are published here for the first time. A further item reflects retrospectively on the project’s cartographic challenges and on how developments in digital map production were decisive in overcoming them. This volume will be invaluable to anyone with an interest in the development and growing impact of mapping the classical world. The Center is pleased to announce a new entry in our Maps for Texts Series. 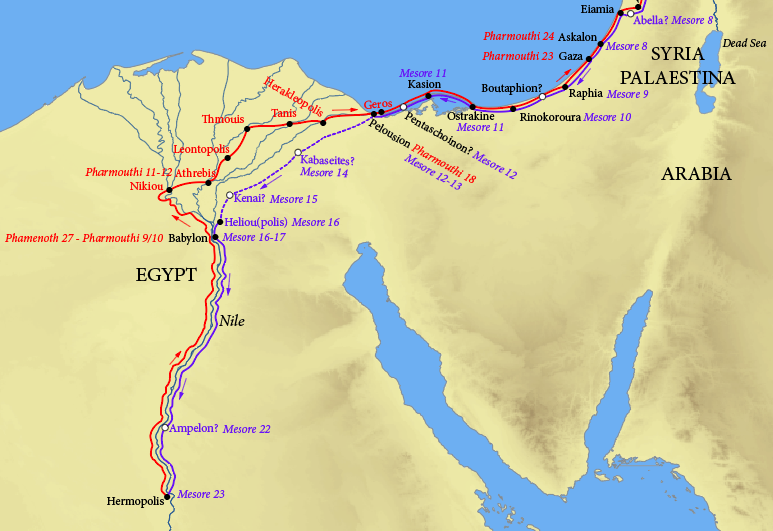 The single, static map (available via dropbox) plots Theophanes’ journeys between Hermopolis and Antioch in the early fourth century C.E., as recorded in the Rylands Papyri. 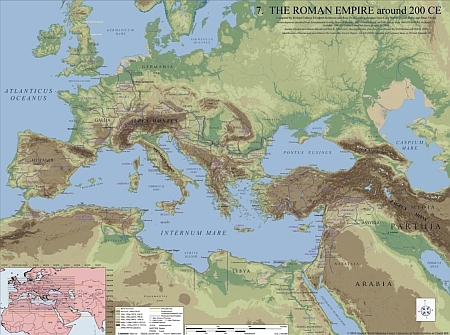 The map is based on the edition by Colin Roberts (1952), and the translation by John Matthews, The Journey of Theophanes: Travel, Business, and Daily Life in the Roman East (2006). The name-forms and dates marked are as in the papyri. Another book of interest for those who study the geography of Asia Minor was published earlier this year. Anca Dan and Stéphane Lebreton’s co-edited second volume of Études des fleuves d’Asie Mineure dans l’Antiquité offers individual case studies of the history and literary attestation of rivers in Asia Minor. Details can be found here. Those with interest in geography and frontiers will be interested in Timothy Mitford’s 2 volume work East of Asia Minor: Rome’s Hidden Frontier. Mitford’s work situates the literary and epigraphic records from the north-eastern frontier of the Roman Empire in the terrain of the region. Details can be found here. The Center is excited to announce a new addition to the Maps for Texts series, an interactive web map of Hierokles’ Synekdemos, available here. The map follows Hierokles’ text in Ernest Honigmann’s edition (Brussels, 1939), and aims to supersede his four maps. With the Center’s Map Tiles as its base, the map marks all cities and regions which may identified and located with at least some confidence according to the Barrington Atlas and related publications listed below. Greek names are transliterated as in the Barrington Atlas (see Directory, p. vii). A full database lists all the place-names in the Synekdemos with references (thus including those that cannot be located and marked on the map). In addition, the text of Honigmann’s edition of the Synekdemos (and of the geographic work of George of Cyprus) is accessible via the Center’s Dropbox. On Hierokles and George of Cyprus, see further briefly, The Oxford Dictionary of Byzantium, ss. vv.